Valentine’s day is almost upon us! You know what really puts people in the mood for romance? I wanted to come up with a cute little romantical cocktail for me and Russell to enjoy on this oh-so-romantic occasion, but for the life of me I couldn’t think of what to serve. Champagne tends to give me a headache if I have more than one glass, and a quick search on pinterest turned up little more than a who’s who of chocolate martinis and syrupy sugar bombs. Not that there’s anything wrong with chocolate martinis and sugar bombs, but they’re really not our thing. Just when I was starting to think that I wasn’t cut out for this whole Valentine’s day thing, it hit me! All I had to do was make a few little tweaks to a favorite cocktails recipe I already had in my arsenal! Russell and I love a traditional (stiff) whiskey sour with lemon juice, superfine sugar and plenty of good American whiskey. I like to use rye because I think it’s more assertive flavor stands up better against the citrus in this drink, but bourbon would definitely work well too if that’s what you prefer. Fresh egg whites are shaken into this classic cocktail to add the signature foamy creaminess that whiskey sours are known for. I always try to buy eggs that come from cage free local farms, so I don’t worry too much about the fact that the whites in this drink are raw, but if you’re concerned about food safety, most grocery stores carry little cartons of pasteurized egg whites that you can use instead. 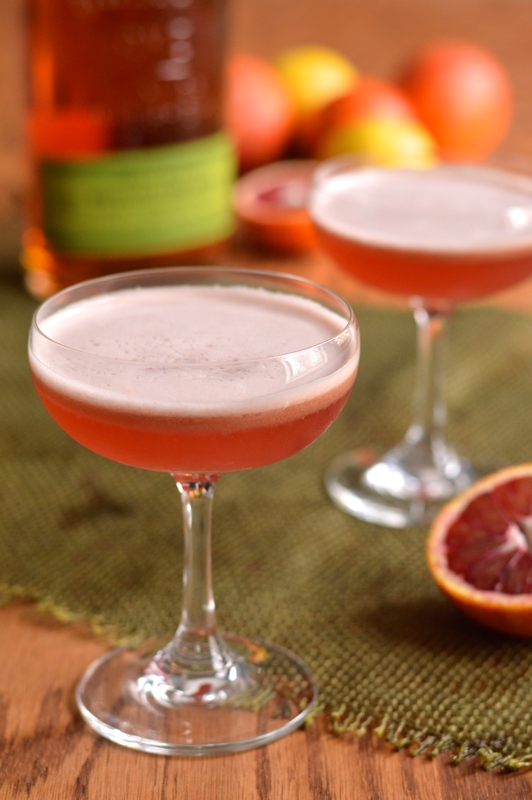 To add a little romance, I substituted some of the lemon juice with fresh squeezed deep red blood orange juice. 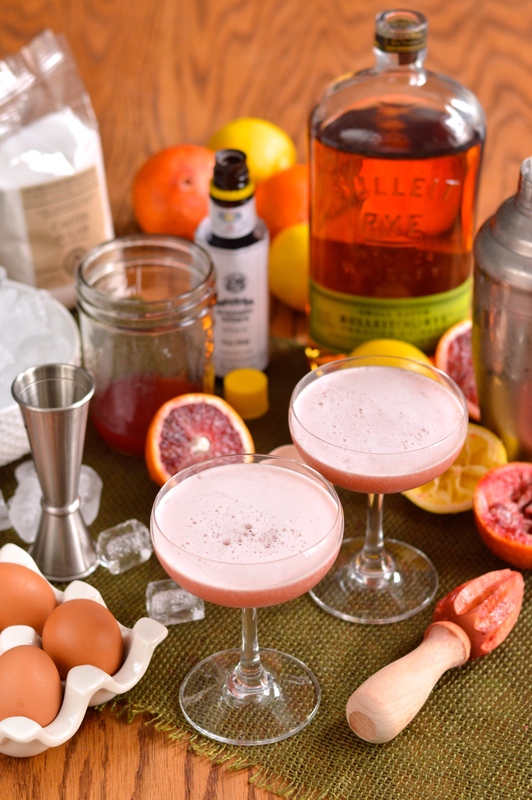 Once it mixed with the other ingredients and had the dickens shaken out of it, the blood orange juice gave this cocktail the sweetest pale pink color you could ever ask for. Don’t let that cutesy pink color fool you though, this cocktail packs plenty of punch. Two ounces of straight whiskey is always guaranteed to get the night started right in my book. While this is a perfect drink to serve your sweetie on Valentine’s day, these classic flavors would also be totally delicious any day of the year. Oh, and hey, if you happen to find yourself alone on this romantic day of days, this recipe makes two cocktails, just enough to make you forget your sorrows or give you the courage to go out and find yourself a date! 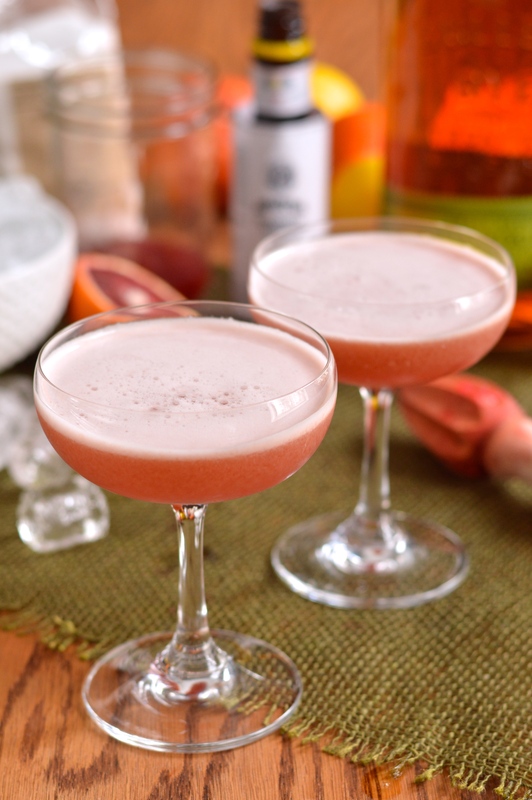 This blushing beauty of a cocktail is bright, fresh and satisfying. 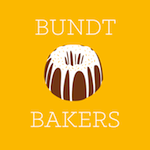 Good looks and great taste, the total package! 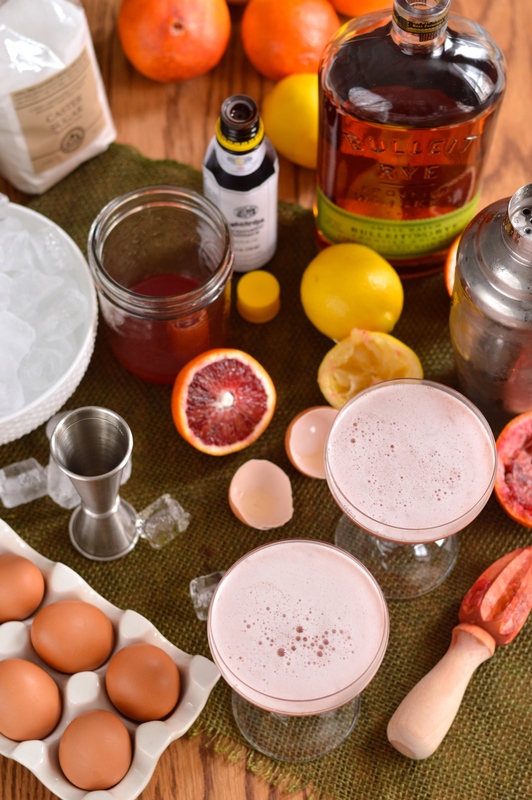 The rye whiskey and fresh citrus play off of each other perfectly and the shaken egg whites add a smooth, creamy, silky mouthfeel. 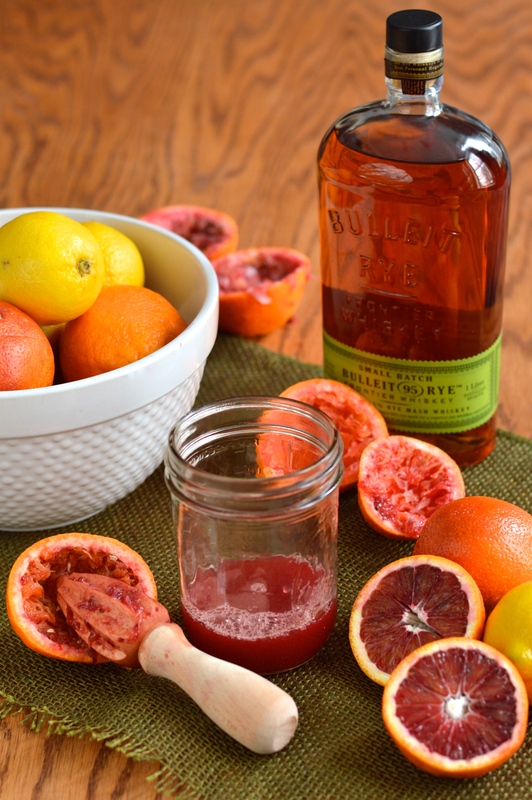 The fresh squeezed blood orange juice adds a bit more sweetness and bright citrusy depth than you’re used to in a whiskey sour, but keeping some of the lemon juice ensures every bit of that sour bite that you expect. Combine all ingredients in a large cocktail shaker, fill with plenty of ice, and shake like crazy for about 30 seconds. Strain into a chilled cocktail glass, or into an ice-filled Old Fashioned glass. If desired, you can garnish with a maraschino cherry or a slice of orange, but I don’t think you’ll need it. this looks amazing – cheers! 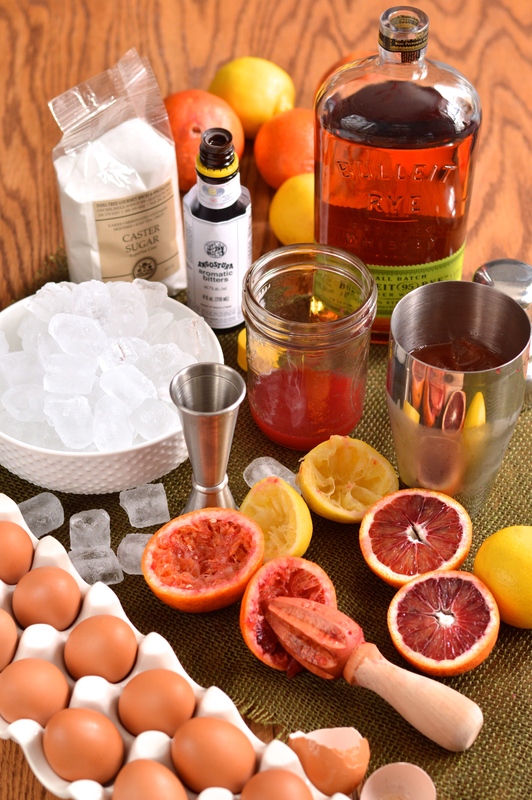 That looks incredible Tux, I love blood oranges and using for a whiskey sour is amazing!!! Thank you! I always forget to buy them, but they work sooooo well with whiskey! Yum! Love the color – great idea. Happy Valentine’s Day! A lovely special cocktail recipe! Blood oranges are also in Season over here in Belgium! They’re so bright and sweet and wonderful when they’re fresh and in season! Yum! Ooh yes! Have a great weekend! Whoa! Look at you go! Happy Valentine’s Day! Hi Tux, keep it to a minimum the Whiskey Sour’s. Do you guys have to work on Saturday?! 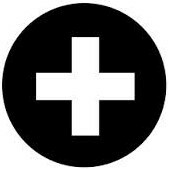 I am thinking headache, hang over whatever…But…then again it could all be worth that. Um. Have a Happy V-Day, too! Thank you so much! I love to hear that! I’ve been really into making Manhattans lately, but need to give these a try! 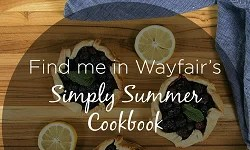 They will be perfect for the upcoming warmer months! I’m usually an old fashioned man myself, but when I want something a little fancier you can’t go wrong with a gussied up whiskey sour! It’s a really delicious combination!